Imagine an omelette with stir fry noodles on the inside. That’s what these egg parcels are all about. 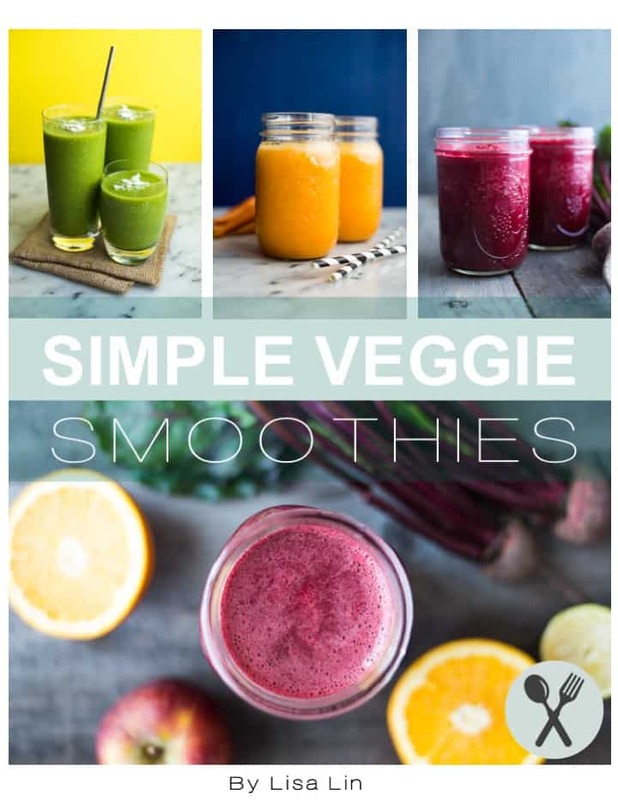 It’s a fun way to shake up your dinner routine! This recipe is all about having fun. Sure, it is much more efficient to scramble the eggs and toss them with the stir fry noodles, but I crave elegant presentation. 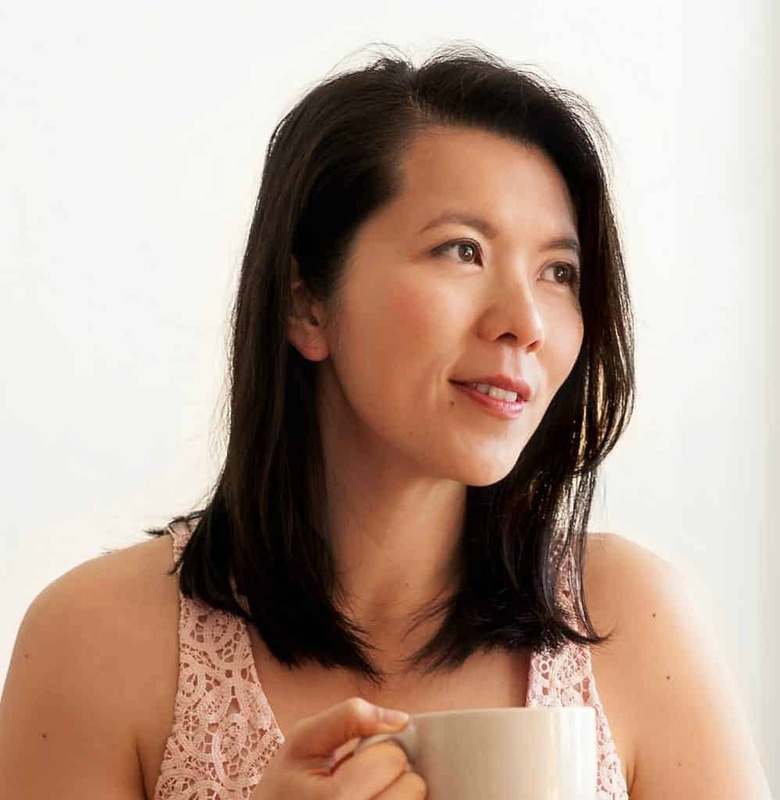 When I flipped through Leela Punyaratabandhu’s Bangkok and saw her Egg-Wrapped Glass Noodle Pad Thai with Shrimp recipe, I was immediately drawn to the playful nature of the plating. I used that idea and made a much more simplified, vegetarian version of the recipe. 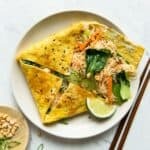 My husband and I have eaten this dish so many times already in the last month (mainly because I had to practice making the egg parcels), but we still love it! Noodle choices: For the recipe, I used maifun (米粉), which are fine rice noodle threads. They cook very quickly—just 2 to 3 minutes in boiled water. I realize that not everyone buys maifun, so you can use any noodles you have on hand. Glass noodles or other rice noodles work very well here. Make sure to use large eggs: You’ll need about 2 large eggs for each omelette. Make sure that the eggs are actually large ones and not medium-sized eggs. You can also use 2 extra-large or jumbo sized eggs for the recipe. If you are using medium-sized eggs, you’ll need 2 1/2 to 3 eggs per omelette. Using the right pan: I highly recommend using a non-stick 12-inch pan for making the omelette. You want to make a relatively big omelette for the dish so that it’s easier for you to wrap the noodles into a parcel. Greasing the pan: You won’t need much oil for greasing the pan, especially if you are using a non-stick one. If you use too much oil, it will be more difficult for you to swirl the raw egg around the pan to form a hole-free omelette. The oil really gets in the way. 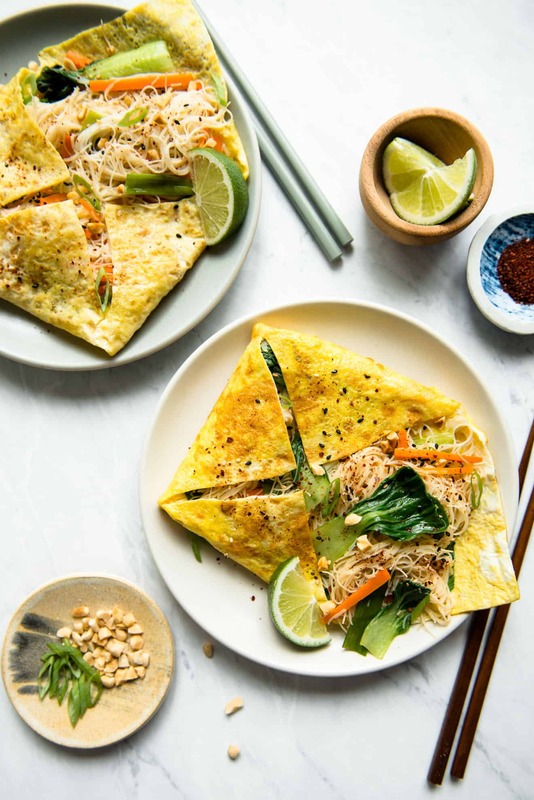 Each of the omelettes can easily wrap around 1 heaping cup of noodles and vegetables. 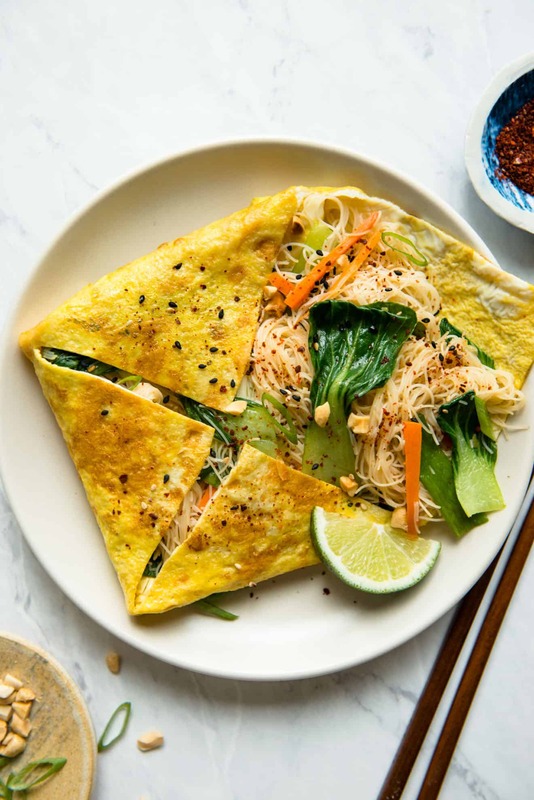 You’ll have enough noodles and stir-fried vegetables to make 4 egg parcels. Typically, for a 2-person dinner, I will make only 2 egg parcels with noodles. There will be a lot of noodles leftover, which my husband and I will pile on our plate if we want more. Fill a 2-quart saucepan with water and bring it to boil. Add the noodles and turn off the heat. Let the noodles sit in the water for about 2 minutes, until they soften. Drain the noodles and rinse with cold water. Set aside. Heat 1 tablespoon of olive oil in a large sauté pan over medium-high heat. Add the onions and cook for 2 minutes. Add the minced ginger and cook for another minute. Mix in the carrots, bok choy, and scallions and cook for 3 to 4 minutes, until the vegetables soften. Season with a pinch of salt. Transfer the noodles to the pan. Add the soy sauce, sweet chili sauce, lime juice, and sesame oil, if using, and toss the sauces with the noodles. Try your best to incorporate the vegetables with the noodles. Turn off the heat. Taste the noodles and adjust the seasoning to your liking. Beat 2 eggs in a small bowl. Heat a non-stick 12-inch pan with 2 teaspoons of oil over medium heat. Swirl the oil around the pan. Add the beaten egg and and swirl it around the pan to form a thin, round omelette. Make sure that there are no holes in the omelette. If it’s not easy for you to swirl the pan, use a spatula to push the runny part of the eggs to fill in the gaps. Cook the egg for 1 to 2 minutes, until it is set and the top is glossy. Turn off the heat. Use tongs to transfer about a heaping cup of noodles and vegetables to the center of the omelette. Using tongs, carefully lift the top and bottom of the omelette and fold towards the center. Then, fold in the left and right sides to get a square pouch. Cover the egg parcel with a plate. With your left hand, hold onto the plate as you flip the pan over with your right hand. This is the safest way to transfer the egg parcel to your plate without ruining the pouch. Beat another two eggs in the bowl and repeat the process for making the egg parcels. You can make 2 egg parcels and have plenty of noodles left over or 4 egg parcels with a little bit of noodles left. Cut open the egg parcels with a knife. Serve the eggs and noodles with sliced limes, peanuts, sesame seeds, pepper flakes, and sliced scallions if you like. You can also use 2 extra-large or jumbo sized eggs for the recipe. If you are using medium-sized eggs, you’ll need 2 1/2 to 3 eggs per omelette. What’s the nutrition info for this recipe?